So I just got my Sckooncup, which I am delighted at, so I will spam you all with pics. The cup, bag, and the resealable bag they came in (in the Ecopac). Which was weird, because I can think of many things that would benefit from a resealable bag, but I don't know if a cup is one. The cotton bag came with the ends untied, which seemed like a recipe for losing the drawstrings, so I tied them up. One of the holes was covered in silicone, and another was partially covered. It took me a while to see it, so I'm not surprised it slipped by quality assurance. I didn't even realize that the hole was completely covered until I tried to push a stick a bit further through and found that I kind of couldn't. I cleared both holes as well as I could, but I wish that they used the rounded edge thing for both sides of the hole rather than just the outside. My current line-up of cups, in the order that I acquired them. Small Yuuki, small Meluna (mini), small Fleurcup, small Lunette, small Si-bell, small Sckooncup. The Fleurcup is actually a pastel purple, which I just realized you can't really tell from these pictures. It got washed out to some grayish thing, yuck. A close-up of my U-shaped cups. Squish tests! Thoughts under ponderings cut. I poured water into the Sckoon all the way to the brim (and then some! Water tension is cool) and then poured it into the Lunette and Si-bell. So, ponderings. I'm wondering whether there are two types of Sckoons floating out there- a super soft one and one that, well, isn't. 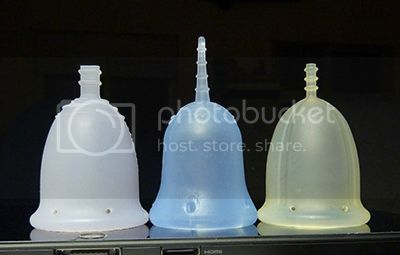 I've read a lot of reports that the Sckoon is as soft as the Si-bell and large Fleurcup, even by people who actually own both and can compare them. 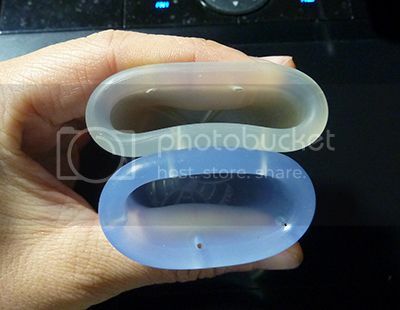 However, I've also seen others that say the Sckoon isn't so soft, more like the small Lunette. Both these people can't be wrong. Mine is most definitely not the super soft one. It's actually a bit stiffer than my small Lunette and is probably more on par with my old classic Meluna small (mini). It's definitely not as stiff as my old stiff Fleurcup. And no way is this softer than the large Fleurcup. 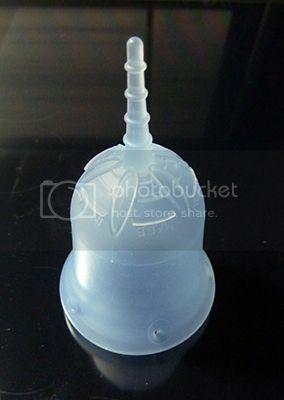 Yeah, I sold them before getting the Sckoon, but I remember very clearly (I think I have pictures to back it up too) that the large Fleurcup and my Si-bell were identical in stiffness- that is, very very soft. There's a bit in the middle of the cup (between the rim and the rounded bottom) that IS very soft, probably as soft as the Si-bell, but it's sandwiched between two stiff parts and honestly is the least important part of the cup. I'm also not sure how people are measuring the capacity of this cup, because it in no way is ever a higher capacity than the small Lunette and like. It only, barely, reached the holes in those cups. So even when comparing capacity-to-the-holes (which I don't really like to do, but others do, so), the Sckoon comes up a bit short. 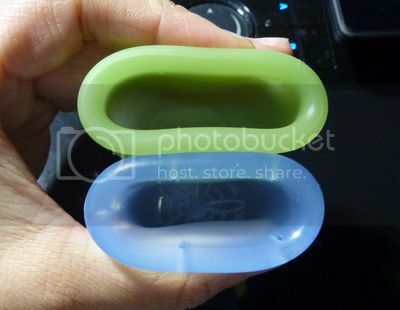 Which makes sense, since it's slightly shorter and narrower, but the company uses somebody's photo in official listings that show the Sckoon as being very slightly higher in capacity than the Lunette and Fleurcup, which I think is a bit misleading since it's not actually true. tl;dr: I think there are two kinds of Sckoons out there, since my Sckoon is stiff like a small Lunette, which I was not expecting. Its capacity is slightly less than Lunettes and Yuukis and Fleurs and Si-bells, which I was expecting. Don't get me wrong; I'm not disappointed in this cup. It's still a very lovely shaped and colored cup. It's stiffness just threw me off. I wish it was a tad softer- I don't like stiff rims (even the rim of the small Lunette is a bit stiff for my tastes) as they're more uncomfortable to remove. Is my small (soft, old design) Yuuki unique in that the rim is softer than the body? Because I love love love that design, but even the Si-bell goes the other way. Are there any other cups like this? Is the new soft Yuuki like this still? Sckooncup owners, chime in! Is yours super soft or not? What color is it and did you buy via Ecopac or regular packaging? I don't think size matters, but let's include it for completeness' sake. Because science. I'd like to get some more info before deciding whether to contact Sckoon and maybe exchange my cup. I think it's weird that this firmness discrepancy exists. There must be a pattern, and if not, well, who wants to play lottery with cup firmness? I didn't like being surprised. Edit: So it seems like it's mostly the light blue and red cups that are firmer than expected, and even that varies by quite a bit (all the way to meluna classic firmness!). Perhaps it's something in the dye? Who knows. $6.90 to exchange my cup seems pretty steep for something that's really on them, not me. I guess I'll contact them and see how it goes. Edit2: So I contacted Sckooncup and they had the gall to tell me that their cups were consistent in quality. Ha! Whatever. They don't seem willing to admit to mistakes, and my opinion of them as a company has fallen quite a bit. I won't bother with the hassle of returning. I guess I'll stick it in my purse to be the emergency back-up/show-off cup. At least I'll be able to use its prettiness for something. Great post! I own a large darkblue Sckoon that I ordered from a local webshop. I also have a large MCUK, so that's the cup I can compare the Sckoon to. My Sckoon feels a lot softer than the MCUK, but its softness is both a blessing and a curse: it is really comfortable to wear (more comfortable than the MCUK), but insertion and removal are quite an issue. After having used the Sckoon for a couple of cycles, getting it to pop open is this still a struggle for me. Also, because its stem is equally soft it's absolutely useless, which makes removal challenging (since I have a very high cervix, I really need a stem)... So if I have to go places and I cannot empty and reinsert my cup at home, I resort to my MCUK because that one turns out to be foolproof and never gave me any trouble whatsoever (it's just sligthly less comfortable to wear when compared to the Sckoon). I can second your comment about the untied drawstrings of the Sckoon's pouch - I lost both mine within three days, lol! Out of curiosity, why do you own so many cups? Are you still searching for your goldilocks cup or are you just curious about all the different brands? It's kind of both. All my cups are pretty similar, but they all have some nitpicks that keep me from being 100% happy with them. Also, I'm trying to see if there's a cup out there that won't leak when I get up in the mornings, but it seems I'm doomed to leak if I change positions suddenly. My closest perfect cup is my old soft Yuuki, but the hollow stem is really big ugh for me (and its holes developed cracks), and I don't know if the new soft design changed more than just the grip rings, so I'm not likely to pick up another. I run the Sckoon cup under cold water to firm it up for insertion (used to do the same with the soft MeLuna). That could help! I have a small red Sckoon, a small Lunette, and a large yellow Sckoon. The large Sckoon is the softest, followed by the small Sckoon, and the Lunette is firmer than both. Given how different the two Sckoons feel from each other, I suspect Sckoon doesn't quality control that aspect--like different batches are usually different textures and firmnesses. FYI, I picked both of them up from Sckoon's storefront on Amazon, and they were normal packaging. And the ends were tied on my pouch strings. Good call with the quality control- I didn't even think of that. Well, I'm never recommending the Sckoon then, no matter how well it works. It's the only cup that's so inconsistent with its firmness, and that's kind of a critical factor when it comes to cups. I have owned a large green, large light blue and small red Sckooncup. The large green is considerably softer than the large blue and small red, which seemed closer to flexibility of the Fleur, though I have not had a small Fleur to compare to, only a large. I don't know if it is quality control, size or color that causes these variances, but I sold the blue and red sckoons. Regarding a soft rim, firmer body style, my Ruby cup rim has more give than the body. It is probably my current goldilocks cup (with the large MCUK and large Iris close seconds). The Ruby seems softer, all around, than the soft small Yuuki I had. I have to say, I am not impressed with the Sckoon marketing campaign. They have too often posted inaccurate claims in comparisons with other cups, to the point I "unliked" them on facebook. Edit to add: bought all the Sckoons new, two of the pouches had the strings tied, one didn't. The Ruby cup is so gorgeous. I wanted it from the moment I saw it, but it's way too big for me. If they ever come out with a small size I'd be all over that. I have a small clear sckoon super squishy, after my learning curve it works like a treat! I compared it to the MCUK small old version and that inflated better than the sckoon first time but the removal was awful. What a rim! I found a way to get it out that was painless in the end but fiddly. I wouldn't have minded but the capacity to the holes wasn't much and I need capacity! I've got a large sckoon on its way in clear so that'll be interesting. And I have a Victoria's love cup on the way which I'm excited about lol. That's quite firm for a cup that's supposed to be one of the softest! I wish firmness wasn't an issue with me, but it kind of is, which is why I got a Si-bell in the first place. My Sckoon isn't firm enough for me to cringe away in horror, but it's enough to give me pause. I bought mine on Amazon. Wanted the ecopac, but it wasn't available at the time in the color I wanted. My bag was untied and I did lose the ends and haven't fixed it so I use my other bags. Definitely one of the prettiest cups. Too bad, it hasn't turned out to be the most functional. I had the same problem with availability on Amazon, but it wasn't urgent so I just sat on it until it came back into stock. Wow, surprising to see these quality issues with the Sckoon. 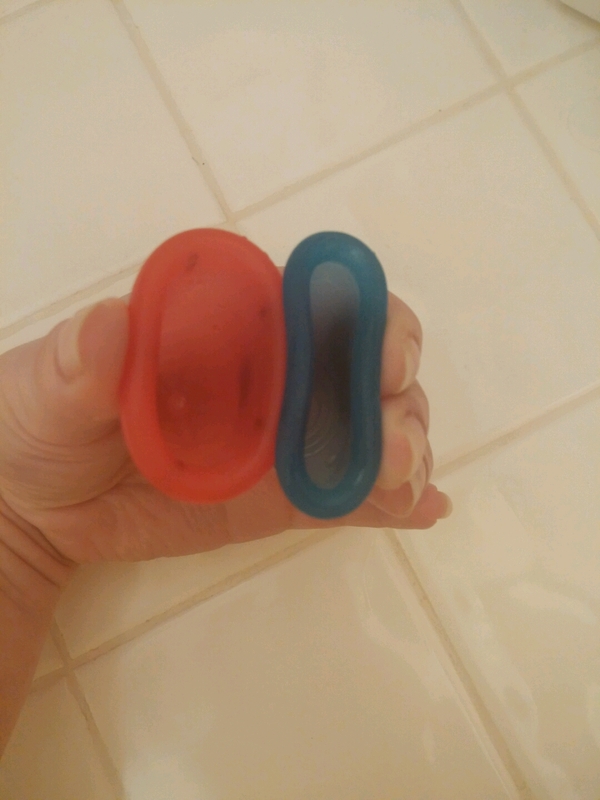 I have both the small and large dark blue Sckoon cups. They are my softest/squishy cups, far more than the small Lunette. However, insertion is a pain. I will give it a try with other new folds, but I'm trying out new cups as well. I'm a little like u, Cup Collector. now Over The Last Year Or So I Have Gone Through Quite A Few Cups, Started With Meluna, Then Scoon Then Si-bell N Luv Ur Body. my Experience With Scoon Was Interesting... Anyhow I Found The Cup Very Soft N Springy, So Popping It Open Was Not An Issue. I Got Small Red Scoon. But Getting It Out (high Cervix) Was Crazy And Very Stressfull, That stretchy Stem Was Ridiculous. My Bag Also Untied By The Second Day. But Overall Quality Of The Cup Was Great, Downfall For Me Was The Removal N Capacity. I Find Si-bell So Much Softer N Lighter N Better Capacity (large Si-bell). Also No Issues With Leaks At Night. Scoon Did Leak. But I Think That Was The Capacity Problem Rather Then Cup Itself. its A Pity That There Is Sooo Many Issues With Sckoon, Cuz Their Cup Design Is Great, But From Reviews That Ive Read Ur Not The Only Unhappy Customer. I'm not unhappy, per se, but merely surprised to get a far firmer cup than I was expecting. I've been hesitant to try it due to the possibly of exchanging or returning, but it's not like it's unusable. From past experiences, firm rims are uncomfortable for me during removal is all. I feel like the only person who likes the stretchy stem, but then again, my cervix is low-ish enough that it's not a problem for me. I'm grateful for the stretchy stem because it's one I don't have to trim (I also have a low cervix). The firmer sckoon should still not be too bad during removal since the sides are smooth to the top and there is no ridge or serious flare at the rim. After trying it out on a dry run, I can see why people complain about the stem. The bottom part of the stem really stretches out into nothing if that's all you can get a grip on, and it doesn't dislodge the cup at all. I may or may not trim that part off, if only so the excessive stretching doesn't annoy me when I instinctively grab onto the first thing I feel. Removal wasn't that bad, honestly. The seal's not as easy to break as the Si-bell, but nothing compares to the Si-bell. Its vertical indents make keeping the seal broken so, so easy. Annoyingly, the soft part of the Sckoon still took a bit of wrangling to fill with air. Luckily, all I had to do was clear an air hole rather than coaxing it to open all the way. I think I'll use a different fold next time. The C-fold is clearly no good even if the cup is only soft around the middle. You're totally right, I forgot about the air hole! I do use the C fold, but I make certain I have a hole in the inner center of the fold, otherwise it doesn't open all the way. great tip about keeping one air hole open like that.